When most people think of pigs, they imagine a barn-side pen with a couple of pink snouts rooting beside a feeding trough. 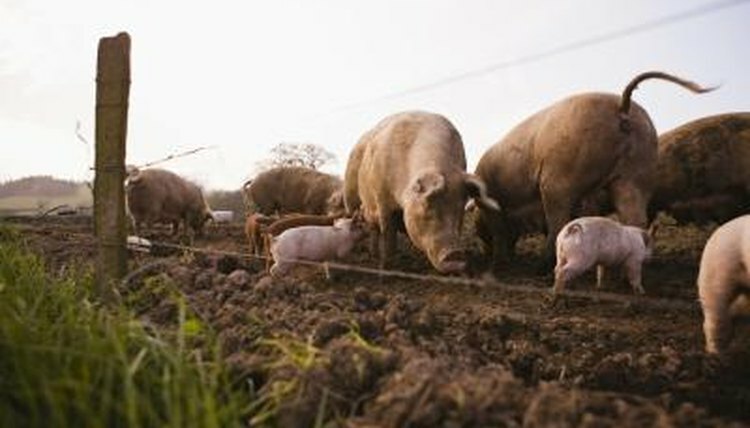 While this isn't an impossible scenario, and some small-scale farmers still host such a setup, the reality is that many pork operations today employ more efficient measures of pig-keeping, systems that also avoid some negatively viewed effects of factory farms. A hoop structure for housing pigs offers a cleaner, cost-efficient method of raising pigs. What Is a Hoop Structure? A hoop structure's appearance is similar to that of a greenhouse used by gardeners or farmers to start seeds in colder temperatures. Curved metal trusses span the length of a frame, and a tarp is drawn tight across the top and attached to the other side—polypropylene is a common tarp material for its weather- and rot-resistant qualities. Both ends are left open to allow airflow through the structure, with fencing extending beyond the structure to allow animals outside access when conditions are right. Inside, the structure's flooring is covered with a thick layer of bedding, usually corn stalks, straw or wood shavings. One of the main benefits of using hoop structures for raising hogs is price. While a conventional metal or wood barn can run upward of $40,000, a hoop structure costs considerably less and can usually be set up for around $6,000—some estimates put hoop construction at $55 per pig, with conventional construction running about $120 per pig. The nature of a hoop structure also makes it possible to add buildings as an operation grows: a typical structure can comfortably hold around 150 pigs, past which point a farmer can add pigs by simply putting up another hoop building. Pigs kept in traditional confinement structures are generally raised on concrete with manure flushed in lagoon systems that store waste in a liquid state. Lagoons are typically foul-smelling and expose pigs to bacteria, and they pose a public health threat through leakage and runoff. The intensive bedding in a hoop structure keeps manure in a solid state and, when the building is cleaned out, the waste material can be collected and composted for later use as a crop fertilizer. Hoop structures are also notably better-smelling than traditional confinement systems. In some ways hoop structures aren't as efficient as traditional confinement barns, most notably during cold temperatures. When an animal experiences cold, it will expend energy to stay warm, converting feed into warmth rather than putting on body weight. With their fabric enclosures and open-air construction, hoop buildings expose hogs to more cold air than a full barn, though the deep bedding does provide a comparable level of heat-preserving insulation.